Fast cars and muscles. Sounds like a great Friday! Well, hello there! It's Friday, we have new products, so why delay? Today we have two new MyoWare products to show off, as well as the 3D printer filament video we promised you last week. Without further ado, let's dive on in and check out what we have! Pretty on par with our predictions ... Special thanks to Gregg for loaning us his Ranger! It was a lot of fun! Thanks for the MyoWare explanation, Nick! Using our muscles to control things is the way that most of us are accustomed to doing it. We push buttons, pull levers, move joysticks ... but what if we could take the buttons, levers and joysticks out of the equation? 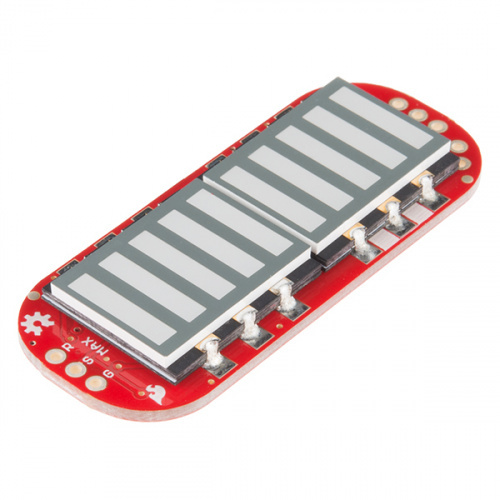 This is the MyoWare Muscle Sensor Development Kit, an Arduino-powered, electromyography (EMG) sensor kit that provides you with a MyoWare Muscle Sensor, each shield developed here at SparkFun, and everything you need to connect them all together. 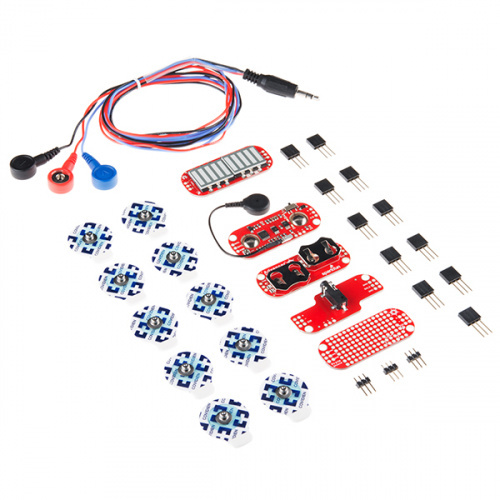 The MyoWare board, included in this kit, acts by measuring the filtered and rectified electrical activity of a muscle, outputting 0-Vs Volts depending on the amount of activity in the selected muscle, where Vs signifies the voltage of the power source. It's very simple to hook up this kit, attach shields to the muscle sensor, stick on a few included electrodes, read the voltage out and flex some muscles! The MyoWare LED Shield is designed to pair with the MyoWare Muscle Sensor. The blue 10-segment bar graph shows the magnitude of the measured signal. The more muscle activation measured, the higher up the board the lit LEDs will go. With this shield you will be get a visual representation of the signals provided by the MyoWare Muscle Sensor and an on-board lithium polymer (LiPo) power source. Alright, folks, that's it for this week. We really hope you enjoyed the videos (let's all admit anything is better than Chris Evans) as well as the new products. We'll be back next Friday with a load of new products! See you then. I know it's a basic review, and having fun in a semi-scientific way, but wouldn't it be better to show the properties of the filaments using more standardized testing methods? I agree with sgrace. Is there more data that you can provide? Strength is an interesting parameter, but what about how it holds up to heat, water, sun (UV)? What is the texture differences (for if you are going to hold it)? Are you able to sand all these materials to make them smoother? I know that if I were making something (say a case for something) these parameters may be more important than just strength. I have been trying to find the best filament for a torsion spring. ABS lost its shape when the spring was tight for some time. PLA is too brittle and you don't get much spring from it before it shatters. From the video it looks like I might have to try nylon next. Interesting video on the filaments. If you carried them in 1.75mm, it would make having an order "ready-to-go" for "nearly free" day very easy. We are definitely looking into 1.75mm. I'd be interested to know what is SparkFun's worst ever product? Now that you got me thinking, personally I'd say the ATmega328 slug. Why? Well I believe we actually had to take them down after realizing it is illegal to sell known counterfeits. The fact that we mentioned they were counterfeits and were not trying to pass them off as working units wasn't enough. Also, notice we got 1500, meaning we were placing orders for ATmega328s in quantities of 1500, we currently use more than that per week! To be honest, I was going to say the same thing. Don't worry we are working on a way to make it much much better. Interesting. But that is more the fault of the action of putting them up for sale that is bad not so much the actual product. I will admit that it can be a bit difficult to print, and is NOT suitable for many things, but there are things which are totally inappropriate for ridgid plastics. See, for instance, sewable 5mm LED mounts which would not work with ABS or PLA. I also just remembered a point that was missed in the video: the smell from the various filaments while printing. PLA (usually) doesn't smell too bad, but my experience with ABS is that it can vary quite a bit by "brand" -- the most obnoxious I've used being a roll of "natural" color that I got at the Fry's Electronics on Baseline in Phoenix. BTW, I seem to recall looking at your offering of NinjaFlex right after I got my printer, but as it was only available in 3mm, and my printer will only do 1.75mm, it was of no use to me, so I got mine from Adafruit.